Cornucopia’s Take: The Real Organic Project has brought to light a shocking practice in large-scale, “organic,” hydroponic production. Many of these facilities are being built on land that has been compacted and doused with herbicides, including glyphosate. While the USDA’s National Organic Program (NOP) uncomfortably insists that this practice is legal because the prohibited substances never touch the plants, most organic producers and eaters would agree that it is antithetical to real organic principles. The regulation found at §205.202, for example, requires that land from which crops are intended to be sold must “have had no prohibited substance… applied to it for a period of 3 years immediately preceding harvest of the crop…” It is unclear how the NOP can work around this regulatory language—and other precepts of organic production—and still maintain these practices are legal. One explanation is that the NOP and their lawyers are willing to bend over backward to accommodate industrial-organic practices. Cornucopia and our supporters care about organic food for many reasons. We enjoy the quality of real organic food, and we know that healthy soil grows healthy plants, resulting in nutrient-dense crops. Truly organic practices also recognize that the land, nature, and humans can work together to produce a thriving system that also supports local communities economically. The NOP continues to assert that hydroponic, aquaponic, and aeroponic production is allowed—and always has been. Their assertion shows that organic law is vulnerable to legal arguments and creative corporate loopholes. Real organic farmers continue to lose their markets to industrial-organic producers whose practices compromise the health of the soil, water, and livestock, as well as the quality of our food. Consumers also have a right to know how their food is produced and how its production impacts the real world. 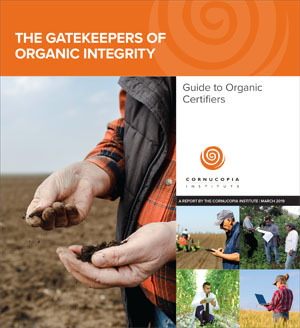 Supporting real organic represents a vote for truth and transparency in a marketplace where regulators seem determined to confuse and muddy the waters. Our Hydroponic Buyer’s Guide outs some of the major “organic” hydroponic brands. These products are far cheaper than soil-grown organic foods—and you get what you pay for. 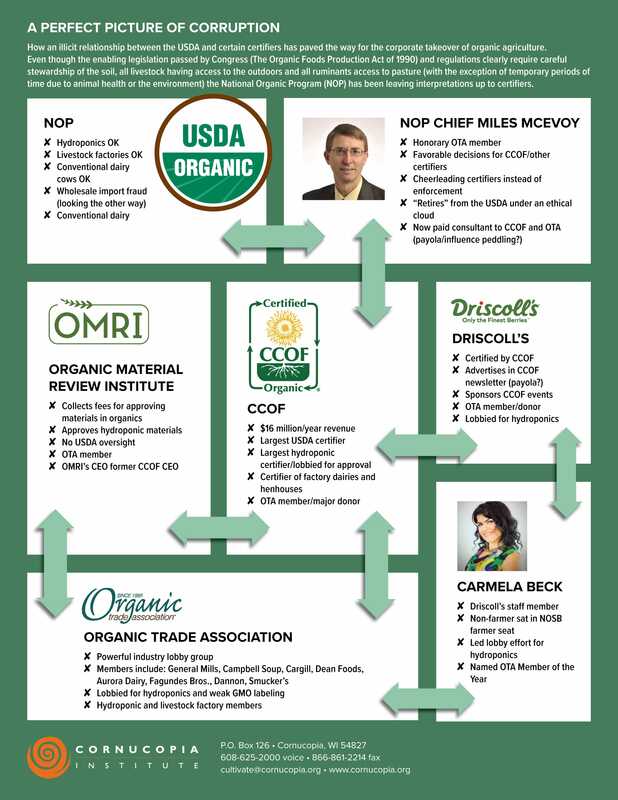 Cornucopia will continue to watchdog the NOP and the organic industry, and we will continue to provide information to consumers about what organic really means. 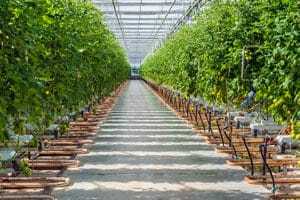 Cornucopia’s Take: Cornucopia has heard from organic farmers and businesses who have asked their certifiers for a moratorium on hydroponics and to identify fraudulent dairies and egg operations. Cornucopia’s infographic, A Perfect Picture of Corruption, shows an example of the some of these conflicts of interest. Cornucopia’s Take: Creativity and diversification may help some organic dairy farmers keep their doors open. The farm in the story below has been able to take advantage of its proximity to major cities. While urban sprawl has meant the death of many farm operations, it seems to be saving this one. “The farm has been here since 1906 but actually the Zwebers have been farming in this area for over eight generations. We are currently grass-fed, organic. Today we have not only our dairy farm, which is about 60 percent of our operation. But we also have a grass-fed beef operation. We have a natural pork operation. We also do pasture chickens and free-range laying hens,” Emily Zweber said to me when I recently visited with AgweekTV colleague Trevor Peterson. You may have never thought of how a family farm stays viable in the midst of urban sprawl. Cornucopia’s Take: The article by OFARM’s John Bobbe below was originally published in The Milkweed. Bobbe is a strong ally in stopping the flow of fraudulent organic imports into the U.S. He has recently retired from OFARM, but he assures us he will continue to work on these important issues. Congratulations to John on his retirement! In the 2018 farm legislation, Senator Tammy Baldwin (D-WI) along with Senator Jon Tester (D-MT), who is also an organic farmer himself, successfully got language of the Organic Farmer and Consumer Protection Act of 2018 inserted into the signed bill (S2927). 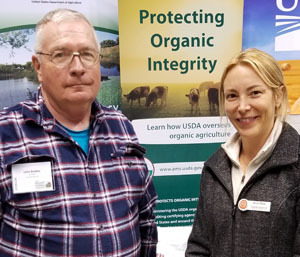 That law gives USDA more funding for organic programs, and also stipulates what USDA must do to insure organic integrity throughout the supply chain — especially for imports. Liberal use of the word “shall” leaves little to no discretion for USDA to interpret how the provisions are to be implemented. Implementation will require at least a year, if not more. The following are some of the specific provisions and language.